Doha, 28 January 2018: Qatar Development Bank (QDB), through its export program ‘Tasdeer’, participated in the 83rd International Green Week in Berlin that took place from January 19th till January 23rd. As part of Qatar Development Bank’s special pavilion, 12 Qatari companies in the Agriculture field and food sector were representing Qatar. The Bank's participation in this important international exhibition comes in the context of supporting local products and introducing them to regional and international markets. The Qatari companies that were selected to participate in the international Green Week in Berlin were: Albina Snack, Gulf Water Plant LLC, United Mineral Water Company Sidra, Qatar Food Factories Co., Lusail Water Company Alkaline, Qatar Meat Production Co., KAAFE Chocolatier, AL-Qaseem Dates, Munah Foodstuff Factgory, Alsulaiteen Group/Saic and Global Farm for Agricultural supplies. The 83rd International Green Week was an opportunity for exhibitors from all over the world to display and market their products, open up to business opportunities, engage in trade agreements and partnership deals especially with the active German trade community. It was also an opportunity for Qatar to promote its products and enhance its position in international markets. H.E. Mr. Mohammed bin Abdullah Al Rumaihi, Minister of Municipalities and Environment of the State of Qatar, inaugurated the Qatari pavilion with the participation of H.E. Mr. Christian Schmidt, Minister of Nutrition and Agriculture of the Federal Republic of Germany, in the presence of H.E. Sheikh Saud Bin Abdulrahman Al Thani, Ambassador of the State of Qatar to the Federal Republic of Germany, during the 'Green Week' International Fair in Berlin, at its 83rd edition. H.E. Al Rumaihi also participated in the 10th Berlin Agriculture Ministers conference in the presence of the Ambassador of the State of Qatar to the Federal Republic of Germany and more than 70 ministers from around the world. H.E. 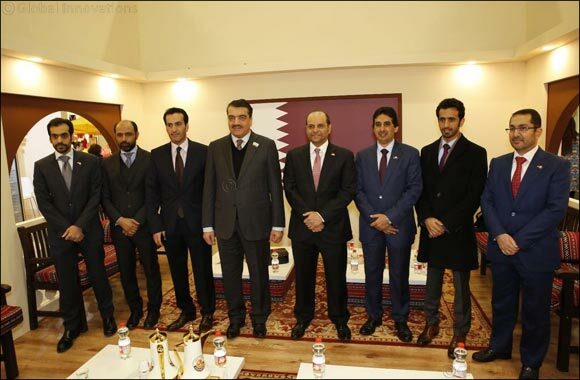 Al Rumaihi held several meetings, In the presence of H.E. Ambassador of the State of Qatar to the Federal Republic of Germany, with the German Federal Minister of Food and Agriculture, Christian Schmidt, and Thomas Zelberhorn, Thomas Zelberhorn, Parliamentary State Secretary to the Federal Minister for Economic Cooperation and Development, which focused on discussing ways of joint collaboration in the agricultural sector, the food industry and related development technology. Additional meetings were also held with Deputy Prime Minister and Minister of Agriculture, Forestry and Food of the Republic of Slovenia Mr Dejan Židan, Somalia's Minister for Agriculture and Irrigation, Said Hussein lid, H.E. Minister of Agriculture and Fisheries of the Sultanate of Oman Dr. Fuad bin Jafar bin Al Sajwani, as well as with Turkish Minister of Food, Agriculture and Livestock, Ahmet Ashraf Fakibaba. It is worth mentioning that due to a very close relationship between the State of Qatar and the Federal Republic of Germany, Qatar was selected to participate in the International “Green Week”, giving the chance for delegated Qatari Businessmen to visit Berlin back in November 2017. This is the first time that the State of Qatar participates in the “International Green Week” represented by Qatar Development Bank, in addition to 15 Qatari companies specializing in food, agriculture and livestock. Since its introduction in the 1920s’, the international Green week in Berlin has grown into the world’s largest consumer show for agriculture, food and horticulture, where carefully selected exhibitors are chosen every year to be the leading and official sponsors of the exhibition. International Green Week is the origin of the Global Forum for Food and Agriculture, where over 80 international ministries and food producers gather to showcase a diverse variety of food and beverage products. The exhibition attracts a huge amount of media coverage and activities as well as a vast number of visitors and consumers from all over the world.